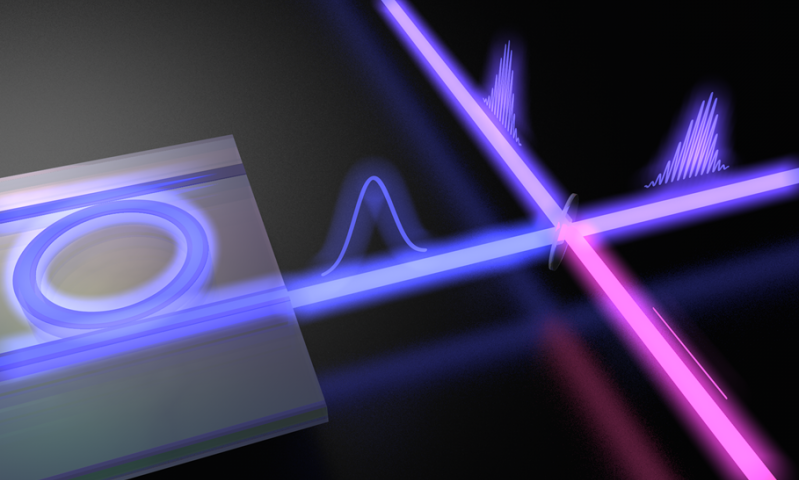 The Ultrafast Optical Processing Group at INRS (Institut national de la recherche scientifique) has redefined the limitations and constraints for ultra-fast pulsed lasers. As reported in Nature Photonics, researchers from the team of Prof. Roberto Morandotti have produced the first pulsed passively mode-locked nanosecond laser, with a record-low and transform-limited spectral width of 105 MHz—more than 100 times lower than any mode-locked laser to date. With a compact architecture, modest power requirements, and the unique ability to resolve the full laser spectrum in the radio frequency (RF) domain, the laser paves the way to full on-chip integration for novel sensing and spectroscopy implementations. Lasers emitting intense light-pulse trains have enabled the observation of numerous phenomena in many different research disciplines, and are the basis of state-of-the-art experiments in modern physics, chemistry, biology, and astronomy. However, high pulse intensities with low repetition rates come at the expense of mediocre noise properties. This is where passively mode-locked laser systems come in: They are the optimal choice for generating low-noise optical pulse trains. Such systems have, for example, made it possible to create stable optical frequency references for metrology (Nobel Prize, 2005) as well as intense ultra-short pulses (i.e., single-cycle pulses in the attosecond regime) for the study of high-intensity light-matter interactions. While many mode-locking techniques have been demonstrated, mainly aimed at creating increasingly shorter pulses with broader spectra, little progress has been achieved so far in tackling the opposite problem: the generation of stable nanosecond narrow-bandwidth pulsed sources. In their latest publication, the INRS research team presents a novel laser architecture that capitalizes on recent advances in nonlinear micro-cavity optics, pushing the boundaries further. Specifically, they exploit the narrowband filter characteristic of integrated micro-ring resonators which, in addition to enabling high nonlinear phase shifts, make it possible to generate nanosecond pulses though mode locking. "The pulsed laser output generated has a spectral bandwidth so narrow it is inaccessible with state-of-the-art optical spectrum analyzers," says Michael Kues, postdoctoral fellow and principal author of the study. To characterize the laser's bandwidth, the researchers instead used a coherent optical beating technique. The record-low laser bandwidth made it possible, for the first time, to measure the full spectral characteristics of a mode-locked laser in the RF domain using widely available RF electronics only and confirming, in turn, the laser's strong temporal coherence. Such stable narrow-bandwidth nanosecond pulsed sources are desirable for many sensing and microscopy applications, as well as for the efficient excitation of atoms and molecules (typically featuring narrow excitation bandwidths). From a fundamental perspective, the low and tractable number of optical laser modes, combined with the RF-accessibility of the associated spectrum, make the team's newly developed laser highly conducive to further study of both nonlinear mode coupling and complex mode-locking regimes.